None of the planets in our solar system follows a perfectly circular path around the sun. All the orbits are ellipses. Mars's orbit is less circular, more oval shaped, more elliptical, than Earth's. Earth stays between 147 million kilometers and 152 million kilometers from the sun (for those of us who think in miles, that's 92 million to 94 million miles), so its orbit is nearly circular. Mars is always farther from the sun than Earth is. At its closest approach to the sun, a point in solar orbit called perihelion, Mars is 207 million kilometers (128 million miles) from our star. At aphelion, the most distant point in a solar orbit, Mars is 249 million kilometers (154 million miles) away from the sun. Next: How long is a year on Mars? Wait, It's HOW Long Until My Birthday?? A year on Mars is much longer than a year on Earth. Just as the space station orbits Earth much more often than the more distant moon orbits Earth,* the sun's inner planets complete their orbits of the sun much more frequently (their orbits take less time) than the outer planets do. We know from our calendars that Earth takes 365 days to circle the sun, right? Actually, it's one-quarter day longer than that, which is why we add a February 29 to our calendar every fourth year. Mars takes 687 days to orbit the sun. That's a long wait between opportunities to blow out candles and overindulge on cake. Youâ€™d definitely want to use EventKeeper if you were on Mars, so you wouldn't miss a friend's birthday party and have to wait 687 days for the next one. *The moon is about 1,000 times as far from Earth as the space station is. The space station orbits Earth every 90 minutes; the moon takes 28 days to orbit Earth. 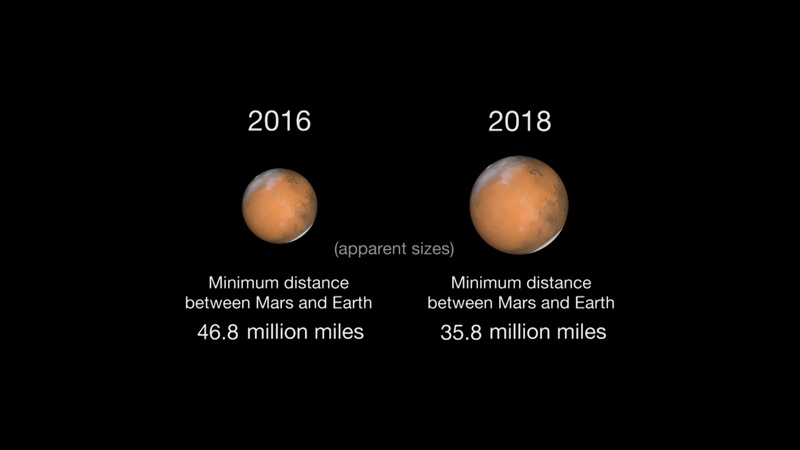 Next: How Close Does Mars Get to Us? Whoa, I'm already 686 days late for something. Take me home. How Close Does Mars Get to Us? The distance from Earth to Mars varies quite a bit. Sometimes Mars is a very long way away, on the far side of the sun from Earth in its 687-day orbit. Earth catches up to and passes Mars about every 780 Earth days. We cross the imaginary line stretching from the sun out to Mars. That is when Earth is closest to Mars. Because Mars's orbit is not as circular as Earth's, at these times of closest approach the distance to Mars will vary a bit. The next time that close approach occurs will be July 31, 2018. (Don't miss it; make a note in EventKeeper.) Mars will be a mere 57.6 million kilometers, or about 36 million miles, overhead as you look up into the sky at midnight. The 2003 close approach, when Mars was 55.8 million kilometers away, was the closest the two planets had been in 60,000 years! TBD : Next: How Big Is That Planet in the Window? I'm feeling far away. Please take me home. Next stop for the Plymouth Rocket - Mars! Plymouth Rocket has always used the rocket image to mean we are going places. And our software is designed to take you places. Now in 2018 we want to go further. You have asked us about an easy way to brand your EventKeeper calendars and for a version of TixKeeper that looks great on a smartphone. We are excited to announce that both things are now available. And we have chosen Mars is a symbol for our new services. We are expanding our horizons, boldly going where no software has gone before and all that. And this year NASA has a new focus on Mars and that vision is our inspiration. The next generation of EventKeeper, called EK MARS, introduces a revolutionary new way to make our calendar your calendar. You can design your own calendar page and then add a handful of special code words that indicate where the EventKeeper pieces should go. If you are using a CMS, like WordPress, Drupal, etc. this is a very simple task. And then you just turn the EK Mars "Creation Crank" and the result is a custom calendar page that looks just like your web site and has all the features of EventKeeper. And, another great implication of this technology is that when your website changes, you just change your EK Mars template, turn the crank and your EventKeeper page is updated, fast and easy. TixKeeper has always had an impressive number of options for configuring how your museum passes are reserved. The next generation of TixKeeper, called TK MARS, introduces a presentation that looks great on all devices; desktop, tablet and smartphone. And now, as part of the information included with each destination, patrons can display a map showing the location and then use map to get directions. So all the current features - and more - are there, but now it's elegant and easy to use on all your platforms.